We all remember the feeling from our teenage years: we arrived half way through a party by which time everyone else had broken the ice and were well on their way to having a great time. Well, it is the same with reviews. But it is surprising how many businesses don't see it that way. If you are one of the many that think you have plenty of time before you need to start worrying about reviews, please read on. We have clients across the spectrum, and we know how consumers behave. Take a simple example of two types of business: hotels and estate agents. A 50 bed hotel turning over £500,000 will typically host 7500 guests in a year; an estate agency turning over a similar amount might only be dealing with 100 clients. If 5% of the hotel's guests write a review, that's 375 reviews, by comparison the estate agent can only expect 5! We know from extensive research that the average consumer will be at least twenty times more inclined to write a review if they are unhappy (for anecdotal evidence of this, just see how many people who have only written one review on TripAdvisor have written a one or two star review). Where does that leave the hotel and the estate agent? It leaves the hotel with about 12% of its reviews being negative (TripAdvisor's own figures). It leaves the estate agent with a massive chance that nearly all its reviews will be negative. Would you stay at this hotel? Now we know that a percentage of the people reading this will say "I would always take a review like this with a pinch of salt" but some will be put off. It's statistically certain. Twelve people have taken the trouble to vote this review 'helpful', and we're sure it wasn't for 'helping me decide to book this hotel'. The other reason we are certain that this review has affected business is because it contains two 'killer' comments, referring to the room as 'tiny' and being 'woken in the night'. Both are fundamental issues that everyone takes into account when choosing a hotel, and readers of this review have no reason to think that this guest was making them up. It is all the more harmful for being one of a very few negative comments about today's number one hotel in London. 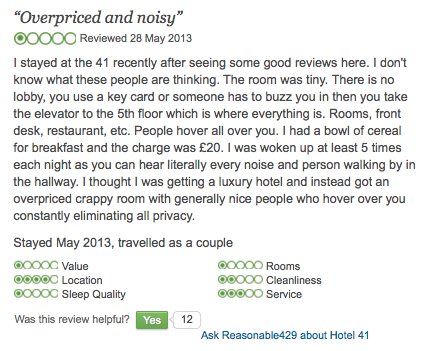 Trust us, if the hotel could pay to have this review deleted there would be three zeros on the end of the amount! Recent research by Harvard University has proved this. This research says that future reviewers are drawn to the mean value of existing reviews. In plain English this means that if all your reviews are 5 star, the next review is more likely to be 5 star, but if many of your reviews are 1 or 2 star, the next reviewer, however happy they may have been, will subconsciously 'mark you down'. They may even decide against posting any review at all that 'swims against the tide'. We all know that hotels and restaurants have historically attracted the bulk of reviews. That's a factor of footfall. Other businesses are starting to attract reviews now, and that puts significant influence into the hands of their few reviewers. If this were the only review of your business, anywhere on the web, and showing up in every search, would you be happy? That the reviewer is right - wouldn't the business have responded if they were not? That the reviewer is right - wouldn't there be other reviews contradicting this one if they were not? That the business is very small - wouldn't there be more reviews if they were not? Google reviews only matter more as time passes. Great reviews drive business your way, negative reviews have the opposite effect. You need to look good when consumers search for your business by name, and, just as important, you need to look better than the competition in generic search: [type of business] + [location]. If you care about the image your business presents online, you have to take reviews seriously. By getting them written to Google in significant numbers, by responding to all of them and by keeping them up-to-date.